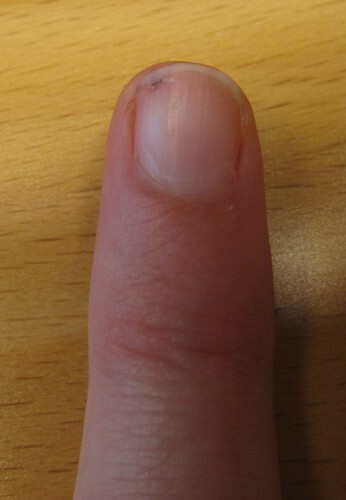 See the little dot on the finger nail? Up to the left? Yeah, that’s blood. Yeah, my finger got caught in the sewing machine yesterday when I practised my quilting skills… The needle went all the way through but I haven’t been able to take a half-decent picture of the dot on the other side of the finger, so you’ll have to trust my word on that. It didn’t hurt too bad. Hardly at all, to be honest. But the throbbing afterwards was annoying. And I got all shakey and dizzy when I realized what had just happened. This entry was posted in A bit of this and a bit of that, Sewing. Bookmark the permalink.